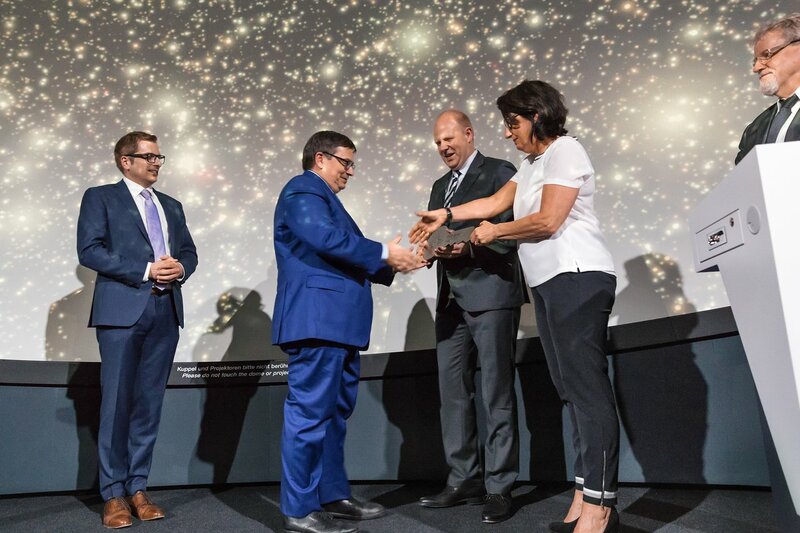 On 26 April 2018, the ESO Supernova Planetarium & Visitor Centre was officially inaugurated, and its doors will be open to the public from tomorrow 28 April 2018. 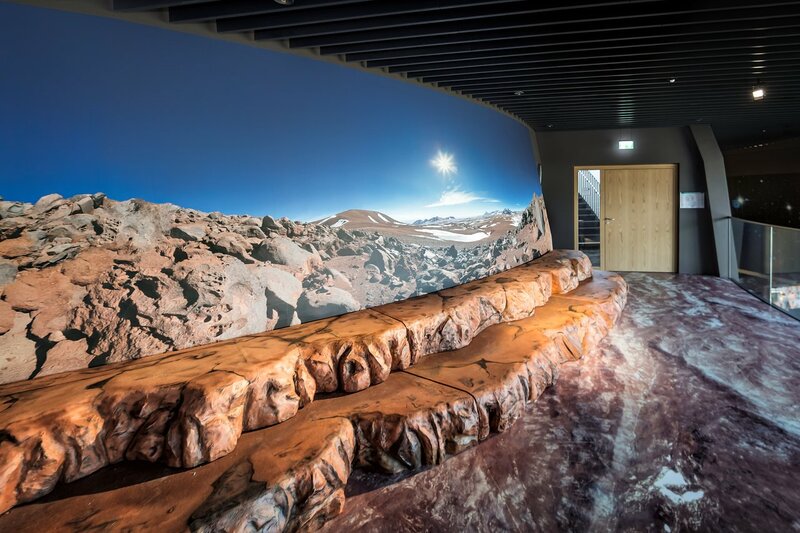 The centre, located at ESO Headquarters in Garching, Germany provides visitors with an immersive experience of astronomy in general, along with ESO-specific scientific results, projects, and technological breakthroughs. All activities in the ESO Supernova will be free of charge during 2018, and shows and other events can be booked online. 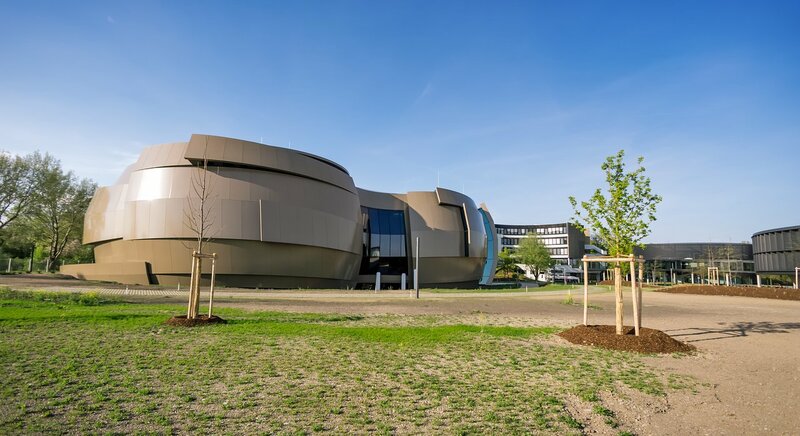 The ESO Supernova Planetarium & Visitor Centre is a cooperation between the European Southern Observatory (ESO) and the Heidelberg Institute for Theoretical Studies (HITS). The building is a donation from the Klaus Tschira Stiftung (KTS), a foundation that promotes natural sciences, mathematics and computer science. ESO will run the facility . The striking building was designed by the architects Bernhardt + Partner. It resembles a close binary star system with one star transferring mass to its companion. This leads to the heavier star exploding as a supernova, briefly shining as bright as all the stars in a galaxy combined. 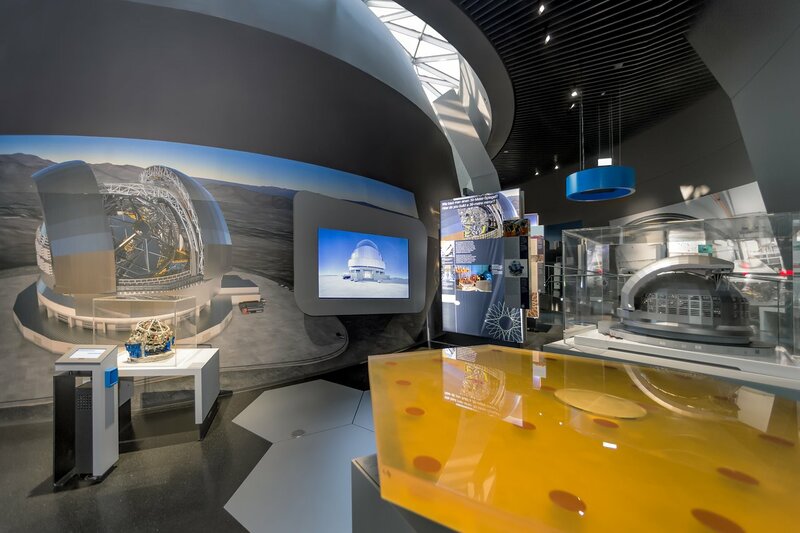 The centre — aptly named the ESO Supernova — similarly shines brightly, to generate enthusiasm and passion for astronomy in the young and not-so-young alike. 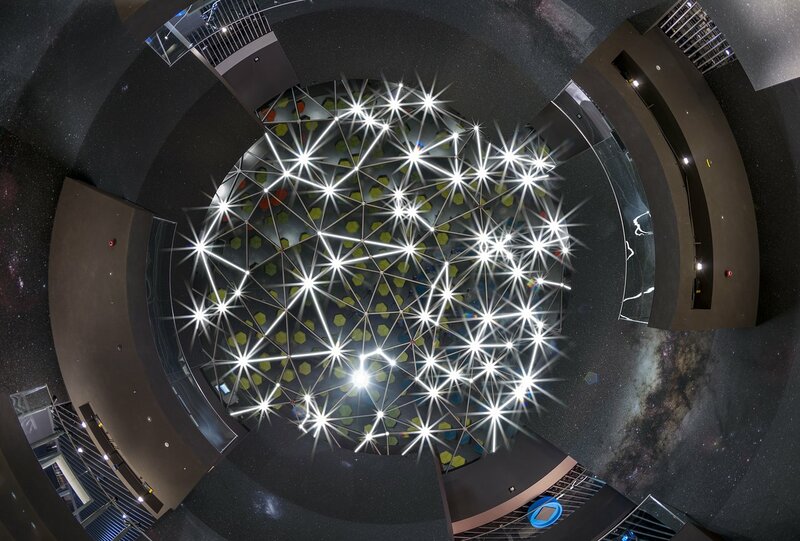 At the heart of the ESO Supernova is a digital planetarium that offers an immersive experience through the use of state-of-the-art visualisation techniques. The planetarium screens many different shows and other cultural events. 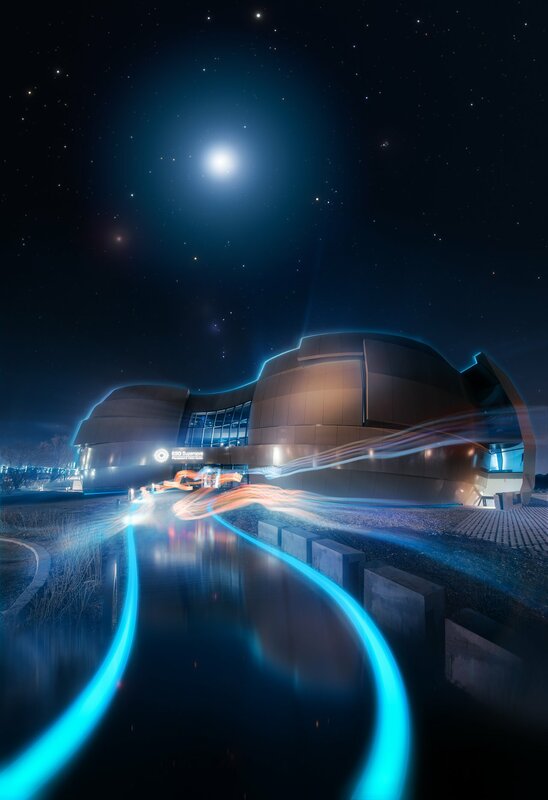 Visitors between April and June 2018 can pick from eight planetarium shows, ranging from the award-winning The Secrets of Gravity animated film about Albert Einstein’s discoveries to the giant-screen documentary adventure Hidden Universe. 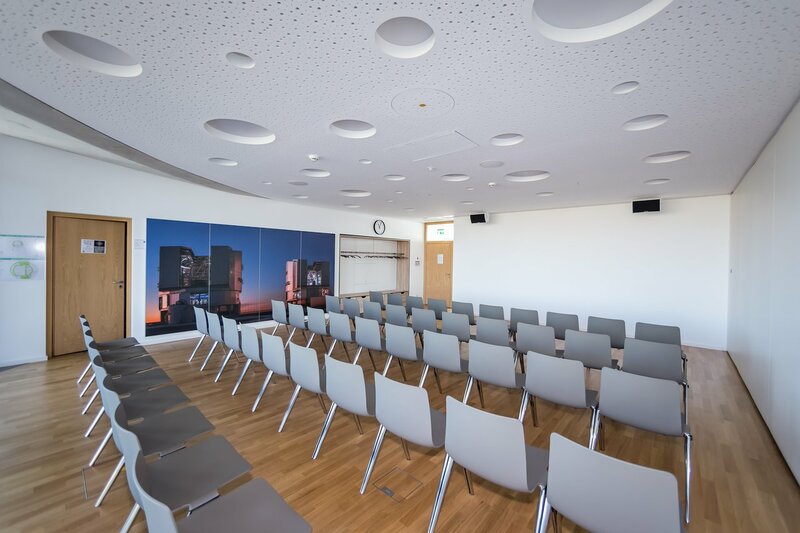 For school classes, the ESO Supernova also offers two specially designed planetarium shows — A Tour of the Solar System and The Skies Above Us — and six workshops specially tailored to the curriculum. The programme for visitor groups is aimed at children in kindergarten, primary school and all secondary schools. 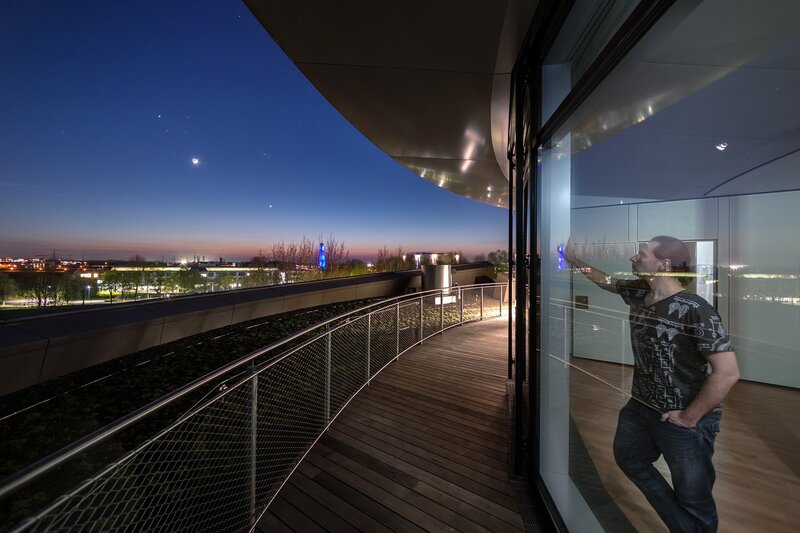 For teachers, the ESO Supernova offers special teacher training. 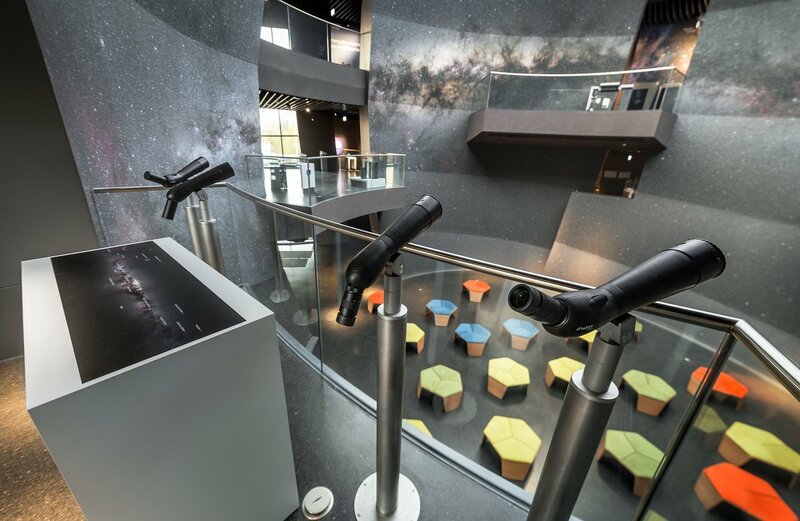 The ESO Supernova also hosts an interactive astronomical exhibition where visitors can explore and examine real astronomical artefacts and conduct experiments to get an idea of what it means to be an astronomer, to work in science, and to discover the mysteries of the Universe. 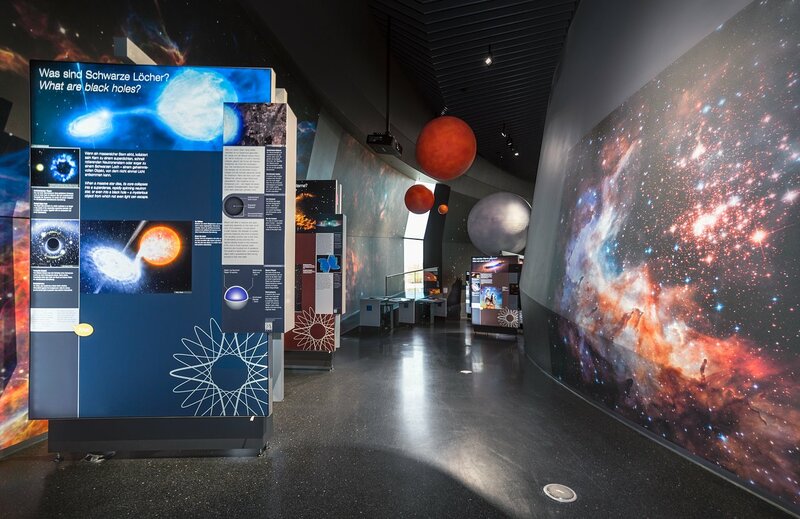 The first permanent exhibition is The Living Universe, which covers the broad topic of life in the Universe. 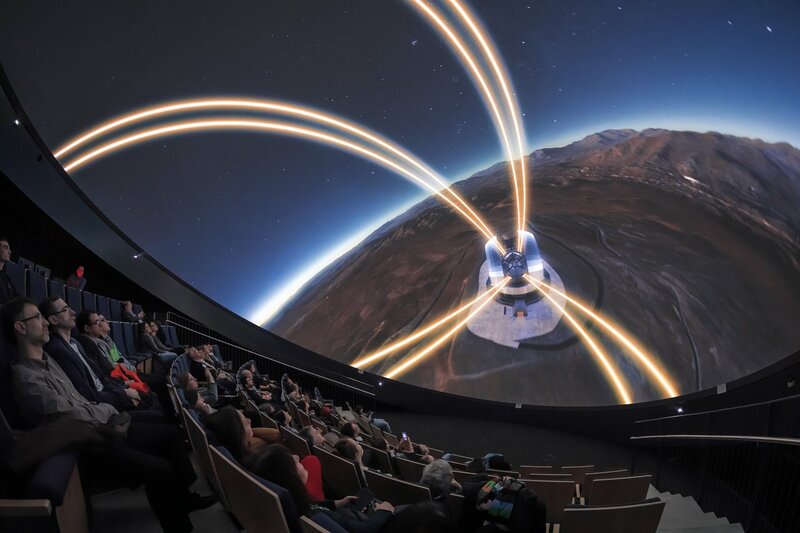 Highlights include: a 40-meter image of the night sky (arguably the largest in the world), a meteorite and a mirror segment from the future Extremely Large Telescope that visitors can touch, a hands-on station where visitors can build their own telescope and athletic visitors can even take a ride on a bicycle that travels at the speed of light! The exhibition can be experienced independently or as part of a guided tour. The seminar rooms on the top floor house space for lectures, workshops and conferences, while The Void on the ground floor is a central area with a unique and beautiful star-roof. 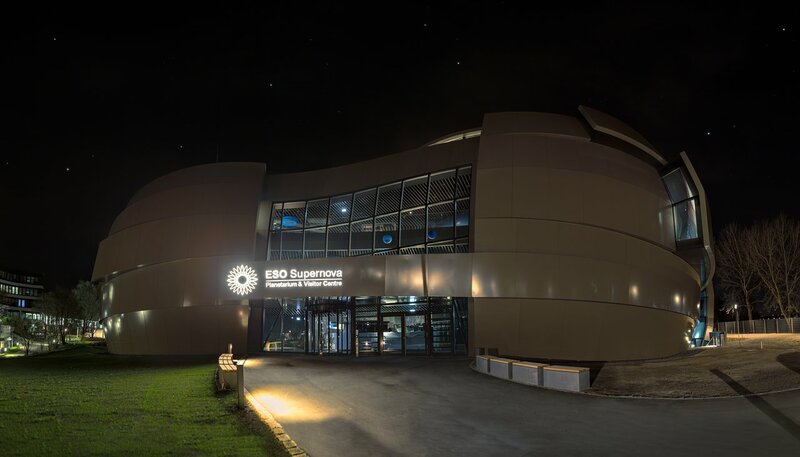 The ESO Supernova will be open each week between 9:00 and 17:00, Wednesdays to Fridays, and between 12:00 and 17:00 on Saturdays and Sundays. Free tickets can be booked online and printed out after arrival at the centre. All content is provided in both English and German and is completely free of charge in 2018. More information, including the programme and details about planning a visit, are available on the ESO Supernova website. 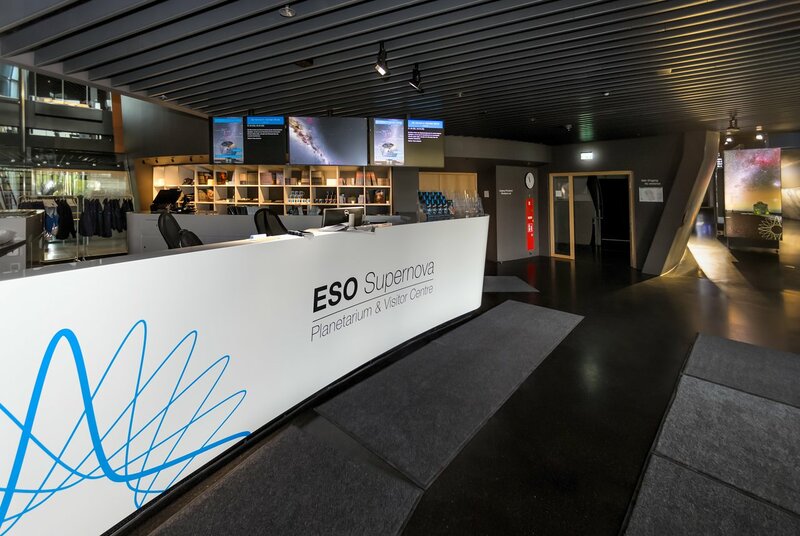 Visitors can sign up for the Public Newsletter and follow @ESOSupernovaDE in German on Facebook and/or Twitter, or @ESOSupernova in English on Facebook and/or Twitter. Media representatives can also sign up to receive news here, while educators have the option to receive a dedicated Education Newsletter. Donations for and partnerships with the ESO Supernova are welcome. The spaces are also available for rent. Having developed the idea for an exciting and innovative new building for astronomy education and public outreach, the late Klaus Tschira, then Managing Director of the Klaus Tschira Stiftung (KTS) and the Heidelberg Institute for Theoretical Studies (HITS), started discussing options with ESO for hosting the facility. 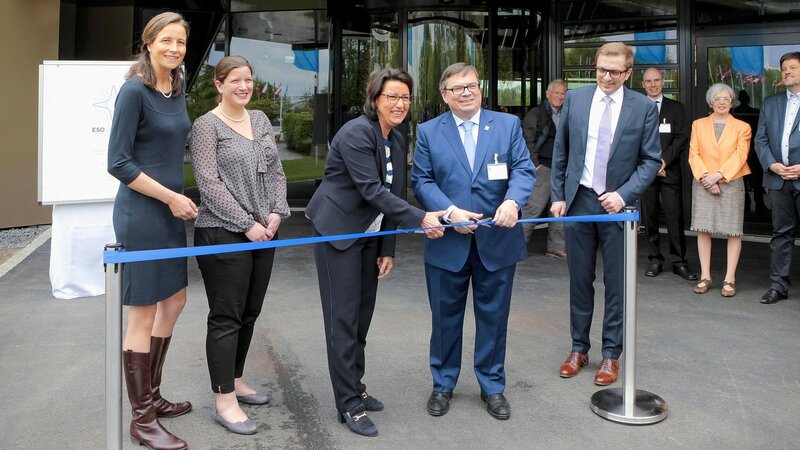 In December 2013, ESO officially accepted the donation of the facility. The Klaus Tschira Stiftung (KTS) was created in 1995 by the physicist and SAP co-founder Klaus Tschira (1940–2015). It is one of Europe’s largest privately funded non-profit foundations. The Foundation promotes the advancement of the natural sciences, mathematics, and computer science, and strives to raise appreciation for these fields. The Foundation’s commitment begins in kindergarten and continues in schools, universities, and research facilities. The Foundation champions new methods of scientific knowledge transfer, and supports both development and intelligible presentation of research findings. The ESO Supernova is a donation from the KTS, and ESO will run the facility. The Heidelberg Institute for Theoretical Studies (HITS gGmbH) was established in 2010 by the physicist and SAP co-founder Klaus Tschira (1940–2015) and the Klaus Tschira Foundation as a private, non-profit research institute. HITS conducts basic research in the natural sciences, mathematics, and computer science, with a focus on the processing, structuring, and analysing large amounts of data. The research fields range from molecular biology to astrophysics. The shareholders of HITS are the HITS Stiftung, which is a subsidiary of the Klaus Tschira Foundation, Heidelberg University and the Karlsruhe Institute of Technology (KIT). HITS also cooperates with other universities and research institutes and with industrial partners. The base funding of HITS is provided by the HITS Stiftung with funds received from the Klaus Tschira Foundation. 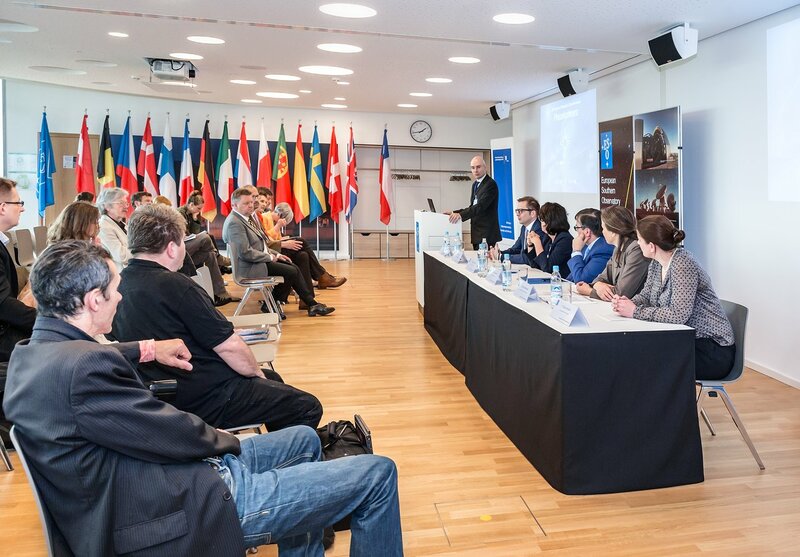 The primary external funding agencies are the Federal Ministry of Education and Research (BMBF), the German Research Foundation (DFG), and the European Union.